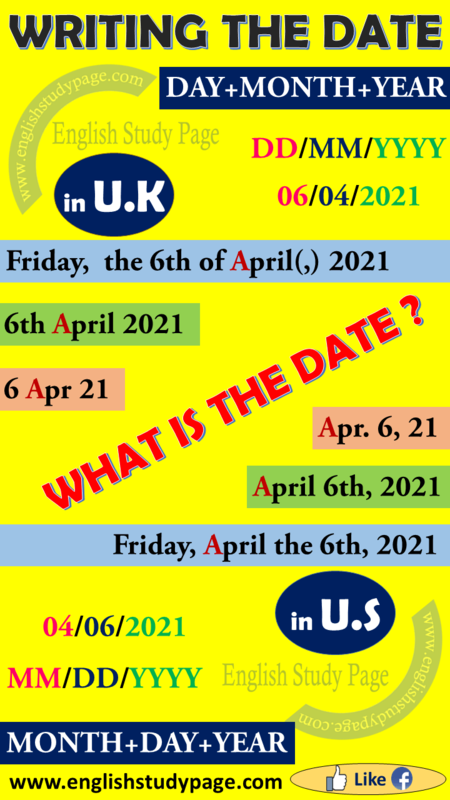 There are different ways to write the date in English according to formal or informal writing, and also British or American English. These are all possible. The more complex the writing of the date is, the more formal it is. While saying the date, we can add “the” and “of”. If we write the date with words and numbers in British English, we can put a comma before the year. However, it is not necessary. If we write the date with words and numbers in American English, we should use a comma to seperate the day and the year. If we use “the” article with the date in British English, we must use “of” also, or vice versa. We can not seperate them each other. If we want to add the name of the day into the date in British English, we should put “the day’s name” before the date, seperating by a comma or we should combine “the day’s name” with “the…of…” without a comma. If we want to add the name of the day into the date in American English, we should put “the day’s name” before the date, seperating by a comma. If we want to write the date with numbers only in British and American English, we should seperate the date’s numbers with slashes, hyphens or dots. For days and specific dates which include specific day(s) in a month, we use “on” as a preposition before the date. For years and months (not including specific day(s)), we use “in” as a preposition before the date. Let see days, months and years in english. 1950 is divided into 19 and 50. (We say “nineteen fifty”). 2) From 2000 until 2009, we do not divide the year into two parts. 3) For 2010 and the later years, we divide the year into two parts again. 2010 is divided into 20 and 10. (We say “twenty ten”).